During registration, you must select “Marketing” emails. After successful signup, verify your ElasticEmail account. 1. You must update your account profile at ElasticEmail before stating to send emails. This can be done from account setting page of ElasticEmail. Click “Update Profile” button, which appears at right side of the screen. Inside new pop-up, update the name, address, tax id, from where you have collected the email list and finally save done. *DNS settings should only have 1 SPF record. If there is an existing SPF record, just add “include:_spf.elasticemail.com” to the existing record. Make sure it is added before any IPs. Value: Please find the value mentioned here. *Elastic Email system will look for either “tracking” or “email” automatically. If another CNAME is used please contact support to get it validated. 9. Add MX record, this record can be added to your sending domain name, when you add a mailbox to your domain name. Having this MX record to your domain confirms that you can receive and process incoming emails to your domain name. You can add Google Apps for Business Mailbox or can use your own mailbox from your hosting provider or can use free mailbox service from Yandex. Detail guide about adding SPF, DKIM and Tracking records to your sending domain name can be found here for EasticEmail. 10. After you are done with above setup, click on “Verify” button which appear under “Use Your Own Domains”, and the confirm if all the records have verified. 11. Now you are ready to use the domain name. 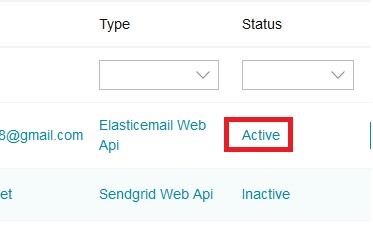 From EasySendy Drip (or EasySendy Pro) Dashboard, go to Delivery Servers > Server Settings > Add ElasticEmail Web Api. 12. Add ElasticEmail API key from your setting page of ElasticEmail screen. Then, add “Username” ans ElasticEmail registered email id, “From Email”, “From Name” and finally, save the settings. 15. This is very important step, where you need to add bounce and complaint notification urls of EasySendy Drip (or EasySendy Pro) inside your ElasticEmail account. 16. Open your previously configured ElasticEmail delivery server in your EasySendy Drip (or EasySendy Pro) account. 17. Go to Edit the server option > click on “Info” tab from the right corner of the screen. 19. Paste the copied notification URL inside the ElasticEmail settings page, under, Notifications > HTTP Web > Notification URL. And select Complaints and Bounce / Error options.